Get your brand noticed with commercial vehicle graphics and fleet wraps by Sign Connection! Providing attractive, cohesive vehicle wraps that showcase your brand provide you with increased visibility and improved customer perception of your business. With custom design, production, and installation for all of your vehicle types, we ensure brand consistency. 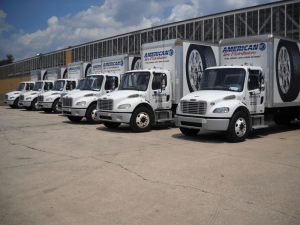 Delivery trucks, work trucks, trailers, vans, buses, semi’s, corporate cars, boats, and even lawnmowers, ATV’s, and golf carts can all be utilized for brand promotion. All you need are the right graphics, the right placement, and the right company to get the job done. Sign Connection is your local fleet wrap provider, handling every aspect of your project. We can’t wait to work with you! Call Sign Connection today at (937) 203-4481 for your Free Consultation! Sign Connection provides a variety of levels of wrap services for all of your vehicle types. From magnets for contractors to full wraps for food trucks, we ensure that your message is properly displayed for the specific vehicle type and use. You may only desire graphics or a logo for some vehicles, while other vehicles may require full, marine-grade wraps. Sign Connection works with you to determine the right material, placement, and marketing elements for each of your fleet vehicles, ensuring consistency and precision through all marketing channels. Whether you prefer an identical design for all vehicles, cohesive custom designs for each, or need help determining how to best present your brand and marketing message on your corporate vehicles, Sign Connection is with you every mile of the journey. Fleet vehicle graphics by Sign Connection are all custom crafted for your business and brand, utilizing your brand messaging, marketing elements, logos, and design ideas. Whether you are a construction company, a landscaper, contractor, delivery service, trucking company, or even just a local business that provides company vehicles, cohesive wraps are a great way to get your business noticed and remembered. With a full wrap design team, we can take your brand elements and design attractive custom wraps that perfectly complement both your message and the vehicle itself. 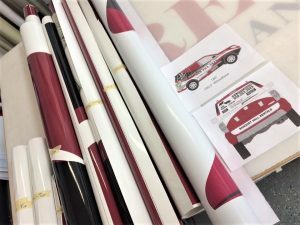 Once we have agreed upon a final wrap design, our in-house production team ensures everything is precisely as you desire, and preps all of the elements for final installation on your commercial vehicles. We are dedicated to delivering high-quality, attractive sign, wrap, and graphic products that deliver for your business. Let’s discuss how we can put your vehicles to work for you today! If your business has multiple vehicles on the road, transporting goods or people from location to location, then fleet wraps are a must. There is no better solution for improving your brand visibility within your local market than the consistent, repetitive exposure commercial vehicle wraps provide. 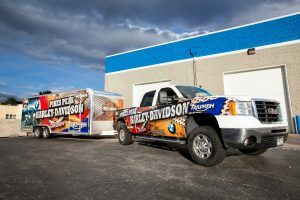 Your local wrap & graphics provider, Sign Connection is committed to outstanding service and a final product that is sure to impress. Call Sign Connection today at (937) 203-4481 for your Free Consultation with a Fleet Wraps Expert! I highly recommend using them for your sign and banner needs! Very prompt and professional service with installation as well.